the PETITION! — There is no "Away"
I'll admit, it's off to a humble start. I'm currently enrolled in the Environmental Forum of Marin, where I expect to gain the contacts, experience, and guidance, to successfully shepherd this important petition all the way to the Marin County Board of Supervisors and beyond. 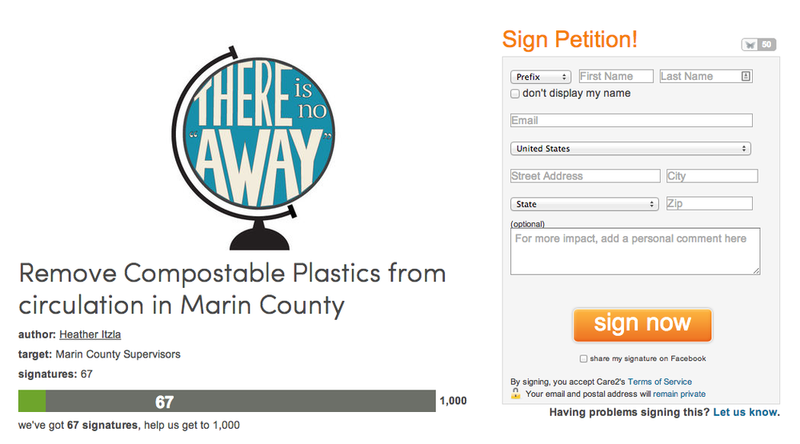 In the meantime, please feel free to review the Little Petition that Could (and will), and if you're frustrated by the truth about bioplastics here in Marin County, Please SIGN!